When we say we are a full service cooling tower contractors, we mean it! No matter what you need for your system, you can get it from us, be it cooling tower engineering and design, erection, inspection and maintenance services. We also work on all brands such as Marley, Evapco, Amcot, SPX and BAC cooling towers. We even will service rooftop units. If you have an existing system, the best place to start is with a series of thorough inspections. After we have evaluated and tested your equipment, we can present you with a program of cooling tower maintenance and any necessary repairs. We can also help you recapture lost efficiency with a system cleaning and/or upgraded components. Because we regularly oversee new cooling tower installations, we are fully equipped for cooling tower maintenance and repair. We can assist you in finding cooling tower parts quick and fast if your cooling tower was to break down. Our personnel understand that any downtime is a detriment to your company. 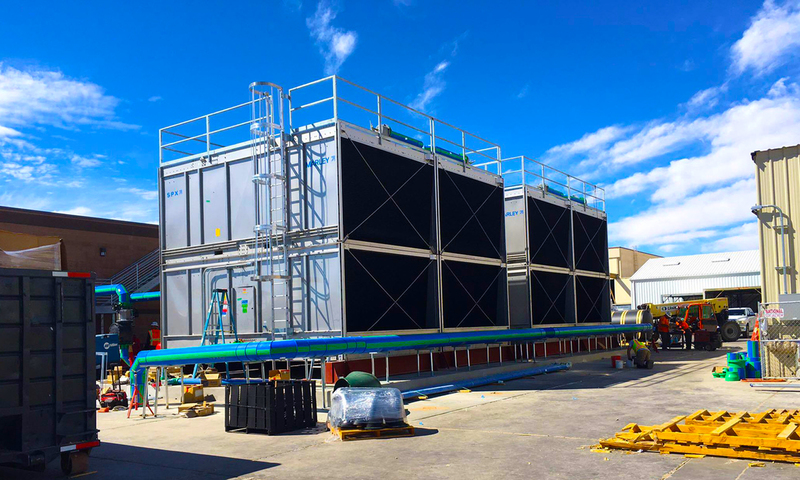 When we are selected as your cooling tower contractors, we will keep every project on time and on budget, as well as recommending the necessary maintenance procedures to avoid future work stoppages. No matter how well your system is maintained, unexpected problems can still occur. We provide emergency repair services twenty-four hours a day, seven days a week. Just give us a call and the Energy Options crew will be on your site ASAP to fix the problem. According to The United States Occupational Safety and Health Administration’s (OSHA) Technical Manual, all cooling towers should be thoroughly disinfected/cleaned a minimum of twice per year. Governmental agencies and industry regulators have increasingly been adopting stringent standards and guidelines that hold organizations and facility managers responsible for cooling tower hygiene. while at the same time, documenting your facilities compliance with the safe water treatment practices. Commercial evaporative cooling systems are particularly vulnerable to the negative effects of mineral build up because they rely on the evaporation of water. Any impurities in your water supply will have nowhere to go except the pipe walls. Energy Options professionals are ready to assist you in keeping your facility operating at maximum efficiency with our meticulous cleaning services. We may also be able to help you reduce the build up of mineral deposits in the future as well. Arrange for a cooling tower cleaning or a cooling tower maintenance quote today by contacting us electronically on our Contact Us page or by calling us directly at 562-408-2600. If you have seen a gradual decline in your cooling tower efficiency, a cleaning may be exactly what you need to repair and revitalize your operation. Of course, if you are establishing a new facility or expanding you should use Energy Options to oversee your cooling tower installations. From the very beginning of the project, we can assist by helping determine the best design and materials for your application and environment. Realizing that cooling system installations are time critical, we will deliver your new tower on time and on budget. Whether you need a large scale multi-tower system or a relatively small roof installation, Energy Options is your best choice to move your project from paper to reality. We offer a range of Marley, BAC, and Evapco cooling tower designs. We will incorporate future needs in the recommendations. Thence, your company will not be limited by the cooling system in the coming years. With over 25 years of history behind us, Energy Options is ready to help you install new tower or provide a cooling tower inspection service. Choose Energy Options for your cooling tower service and installation needs and take advantage of our experience and skill. Whether you are in need of a new system or have an existing system to maintain, Energy Options is your cooling tower devices solution. We offer maintenance and inspection of dry fluid coolers, industrial tower or other equipment. This allows us to report which components, if any, are in need of repair, adjustment or upgrade. The inspection also allow us determine what else may be done to achieve maximum cooling system efficiency. Often the answer is a thorough cleaning of your equipment. Merely removing accumulated mineral deposits along the system’s pipe walls restore a great deal of performance. If this is the case with your cooling tower we can also recommend and install sand filters or other equipment to help minimize this problems in the future. We also can consult with you about replacement fill options to increase efficiency. No matter what cooling system related service you need, you can trust Energy Options. Contact us online or call us at 562-408-2600 to begin the process of servicing your current system or installing an entirely new unit. Contact us by phone at 562-408-2600 or fill out an online parts request form so we may begin assisting you with the items you need. Your tower’s fill is vital to efficient operation. Cooling tower replacement fill can make a major and immediate difference in overall performance. We can help you determine if it is time to replace your fill or adjust the fill product you are currently using. Energy Options carries many types of both film and splash style products so we are well equipped to help you find the best fill for your system. From construction to repair and maintenance, Energy Options, a cooling tower contractor, is your full service cooling tower support company. Contact us to learn more about the availability of specific cooling tower parts, cleaning or any of our services by phone at 562-408-2600 or over the Internet with our convenient electronic form found on our Contact or Estimate pages.